Investors can't get to Europe fast enough. American cash is pouring into European stocks. Last week alone, U.S.-based funds sent a record amount --$3.9 billion -- into Europe equities. That's according to EPFR Global, a research firm that tracks fund flow data. "The trend is definitely accelerating," says Cameron Brandt, director of research at EPFR. U.S. investments going to Europe thru mid-March have already outpaced February's total and are triple the size of January's figure. Europe's stock success: It's no secret that European stocks are hot right now. Since the European Central Bank announced its stimulus plan for the continent in January, markets have surged. The STOXX index (SXXL) is up 16% this year while Germany's DAX has risen 21% in 2015. Markets in Belgium, Sweden and even Spain -- yes, Spain! -- are doing great so far too. That's a lot better than the U.S. markets, which are up just over 1% so far this year. As U.S. stocks look pricey, investors see more upside potential across the pond. "It's time for Europe to play catch up," says Kevin Kelly, portfolio manager at Recon Capital, which holds investments in Europe. "That's why you're seeing investors and funds flow into Europe." The stimulus plan has weakened the value of the euro, and at the same time the U.S. dollar is gaining value. The euro has rallied a bit this week, but it's still near 12-year lows. 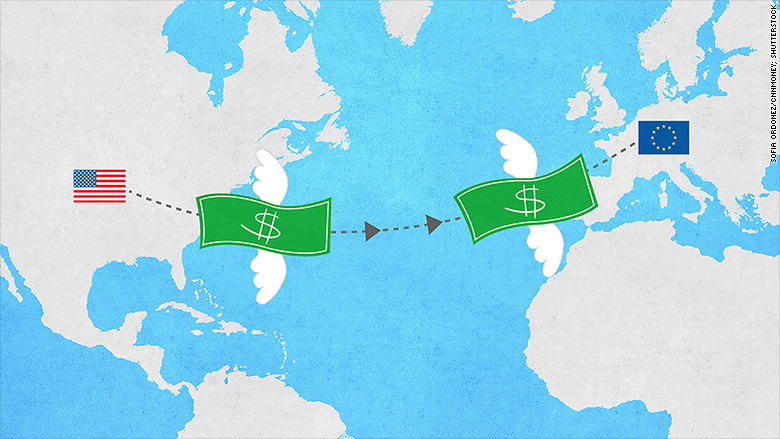 Many believe the dollar and euro could be equal later this year. The currency situation makes European companies more attractive to investors because their products are cheaper to sell than American companies' products. European exports are on the rise, and the eurozone economy is showing signs of a pick up. Expect the trend to continue: The flood of money into Europe is unlikely to stop any time soon. Sixty-three percent of fund managers want to invest more in Europe this year, according to the most recent BofA (BAC) Merrill Lynch fund manager survey. That's the highest rate since 2001. One of the hot-ticket items right now for investors is exchange-traded fund (ETF) that own European stocks. Investment in those ETFs so far this year has doubled compared to the same time a year ago, according to BlackRock. I like Europe, but not the euro: There's just one problem for American investors looking to cash in on Europe right now: the euro. A 16% return for European stocks in euros doesn't look so good when you translate that back to U.S. dollars. That's why investors are looking for ways to protect against a further decline in the euro. Related: What's an exchange-traded fund? Enter the ETF that takes out, or hedges against, the euro and all its troubles. It allows investors to put their money in a fund that covers a variety of European stocks without losing a profit due to the euro's weakness. "Currency hedged ETFs are very popular right now," says Marc Chandler, head of currency strategy at Brown Brothers Harriman, a private bank. Deutsche Bank (DB) just launched three new ETFs that all hedge against currencies. BlackRock's (BLK) iShares hedged ETF in Germany is up 15% in the past few months. Another euro-hedged ETF run by WisdomTree (WETF) is up over 20% this year. It covers stocks in Germany, Spain and France, such as Daimler and Anheuser-Busch. "You now have the choice to say, 'I like Europe, I don't like the Euro,'" says Chris Gannatti, associate director of research at WisdomTree, which specializes in ETFs.